Whether you are looking for a professionally installed laminate floor or plan to do-it-yourself we have a great selection of wood, stone and tile patterns in a wide array of textures, finishes, rich styles and natural looking colors. We offer Quick Step, and Pergo laminate flooring and you can find everything from the thicker 12mm higher-end laminates to the budget-minded, click-lock laminate floors, and all prices that beat the competition. Amazing Durability & Realism For Any Décor! Families with active lifestyles that are looking for wood, stone, or tile floors that can stand up to lots of household traffic and won't stain or scuff should definitely stop in and see our laminate flooring selection. You will be amazed by our wide assortment of colors, textures and styles that have unsurpassed realism and economically priced. From formal, traditional, contemporary and country our professionally-trained sales staff can help you find the best laminate floor that is just right for you! Reliable, friendly service and expert installation! Our installers are among the most highly trained in the flooring business and you will always be assured of quality workmanship and professionalism -- We Guarantee It! 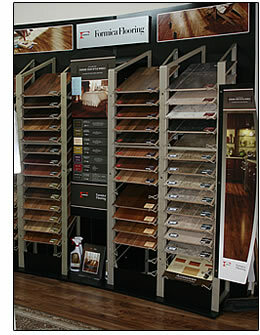 We also carry a complete line of laminate flooring accessories for the do-it-yourself homeowners.